Gemstones are incredible treasures--to imagine how they formed, solely by Mother Nature, makes them even more unbelievable. It is also amazing to think about how you, of all people in this entire world, happen to end up with a certain gem and are now responsible for its new journey as a faceted stone. 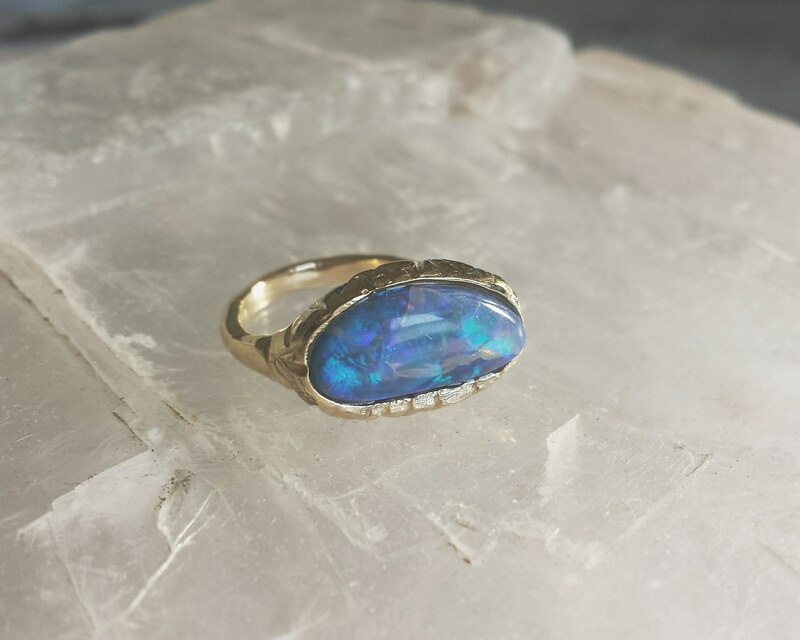 I've had the privilege of being an owner to two very special gemstones--a Tanzanian Rhodolite Garnet, 2.12 carats, from the extremely talented gemstone wizard Top Notch Faceting and this crazy cool opal from Australia I got years ago in Tucson. Both stones seemed to always want to be more than just gemstones--they longed to be a gorgeous piece of finished jewelry. It was up to me as their new owner to decide what their transformation would look like--would they become rings or necklaces? What design would be best? Which designer could make them come alive? What metal would I choose? With so many possibilities, they sat for a few years before everything fell into place! 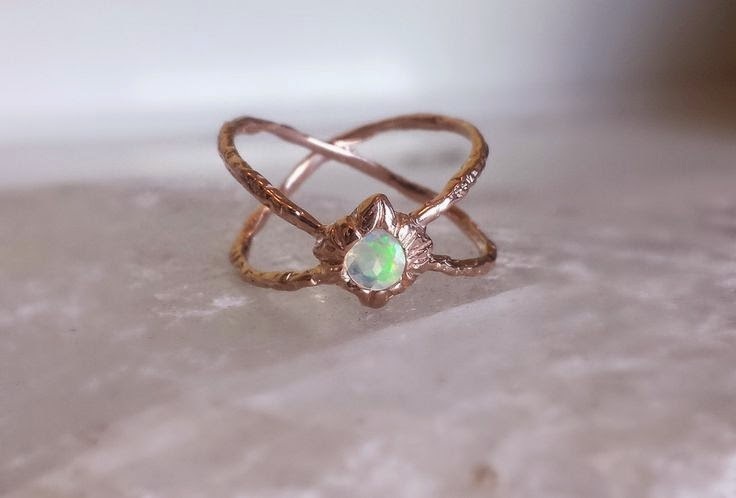 I knew I wanted my stones to be set in yellow gold, as both garnet and opal look radiant in yellow gold. 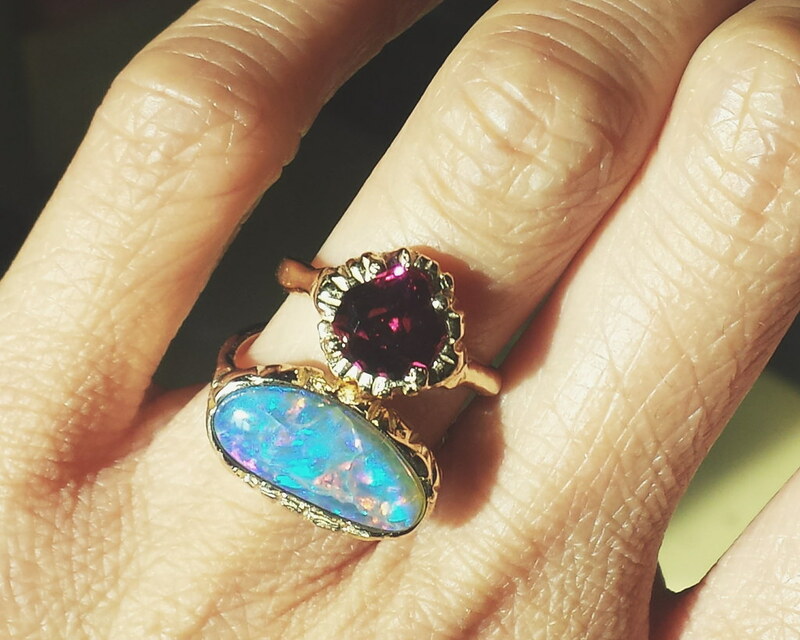 The rich, wine-colored rhodolite garnet glistens against the bright yellow gold; same with opal. The shapes of these two stones is what makes them so unique as well--a Top Notch Faceted stone is unlike any others, with his award-winning technique and passion for each gemstone he works on. 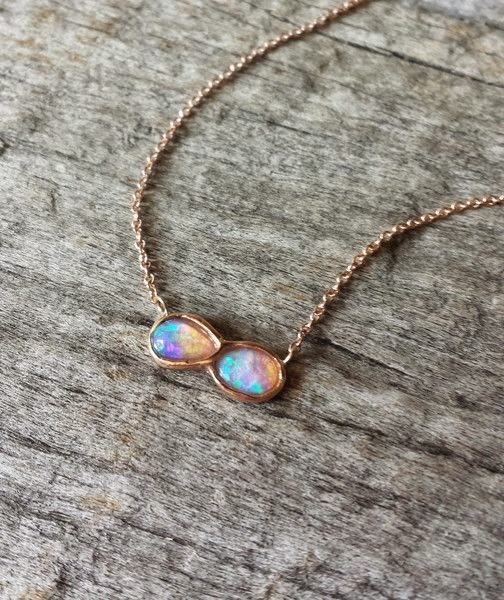 The opal is elongated which would primarily make for a great drop pendant--but I knew I craved something different and not your typically designed piece of jewelry. 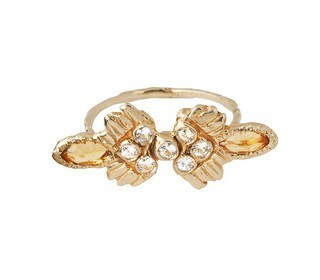 Of course, we all know how ring-obsessed I am, so it wouldn't be right if I had made these stones into anything else! 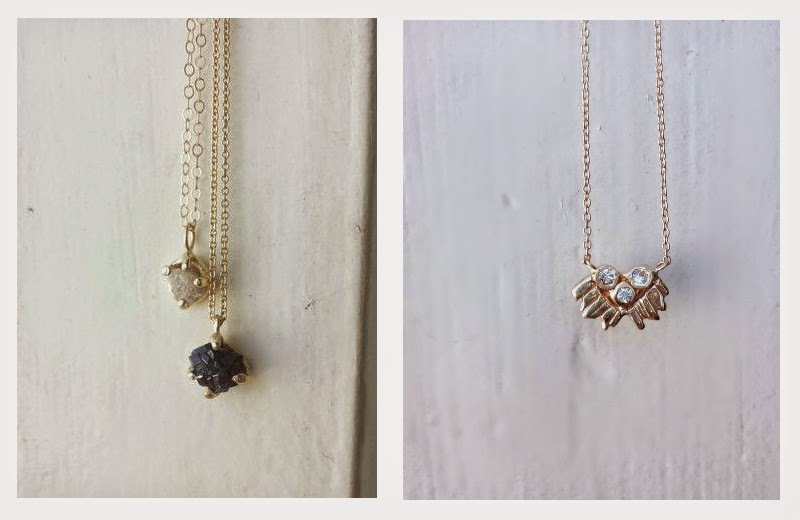 The last parts of the tale of two gemstones are the most crucial, yet easiest decisions for myself. 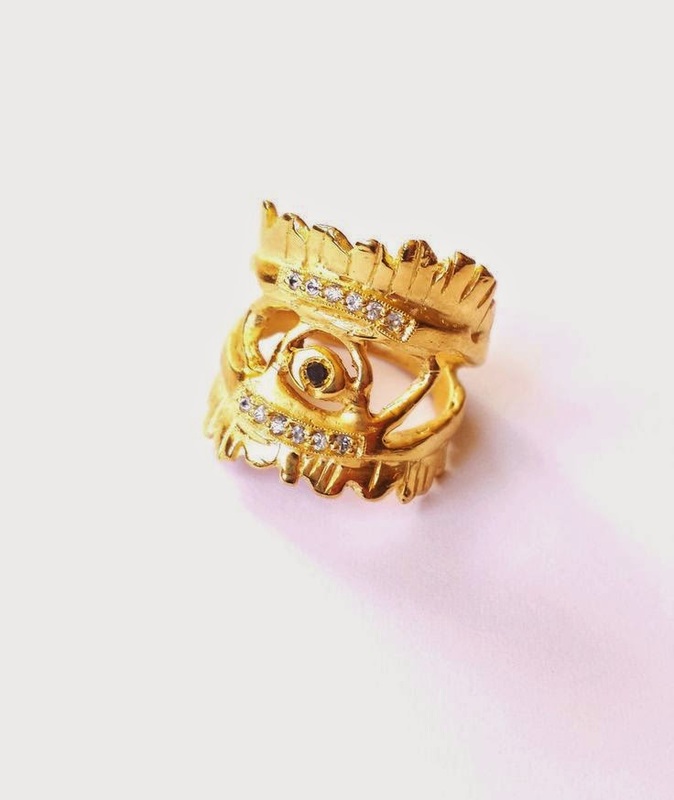 After working with and thoroughly enjoying my Eye of the Warrior ring that I received last fall from Communion by Joy, I knew I not only loved her aesthetic but I trusted her judgement as a designer and creative spirit. 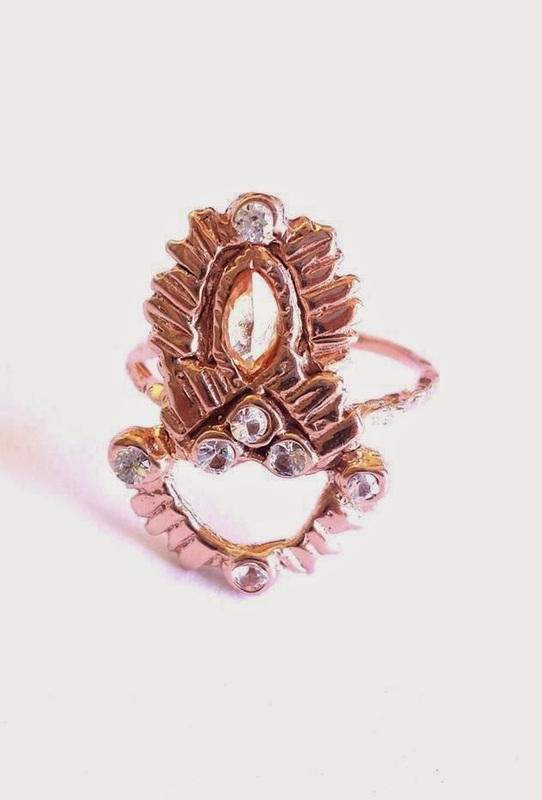 I sent Joy my stones without any instruction besides my ring size and the requirement of 14k yellow gold. That's it! 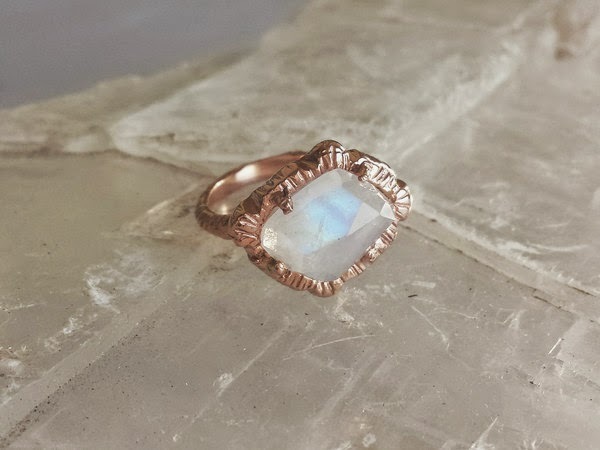 I let her as a designer run free with what the stones spoke to her--something most people that get custom work done seldom do. I was so pleased with the outcome of what Joy has created. 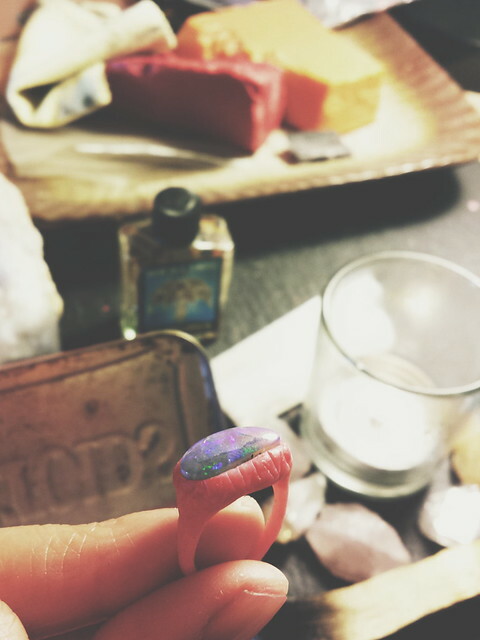 A morning of therapeutic wax carving, mixed with meditation, followed by casting has yielded these two beautiful rings that will forever be in my collection. Another exciting bit of information on Joy's jewelry--her fine jewelry collection has officially launched, as well as her one-of-a-kind pieces, which includes some limited edition items. This marks the beginning of an era that Joy has been working towards and she is excited to be working exclusively in precious metals. As always, her signature style and West Coast aura are still front and center of each and every design. Excited to see what is to come for this talented woman! For Joy Smith, it all started in an art gallery. She had studied art history in college and dabbled in painting and drawing, but it was when she worked at a gallery that she realized she wanted to be the artist. 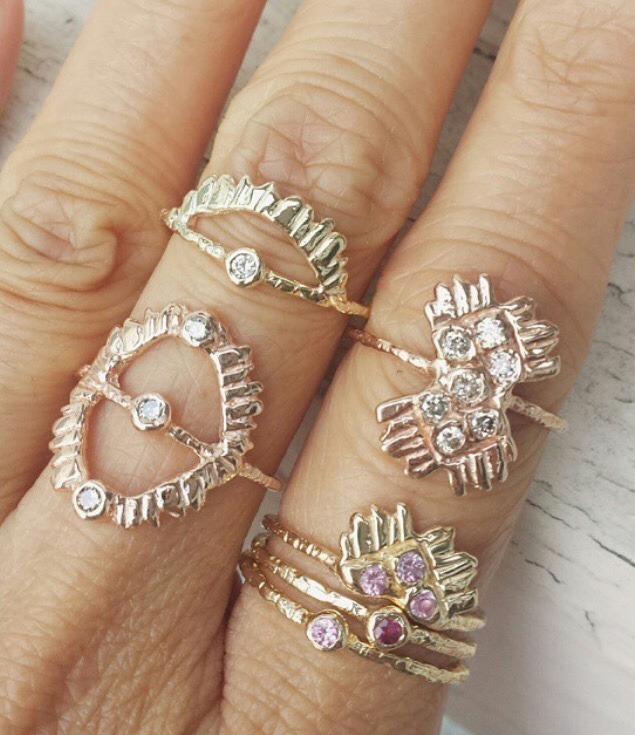 After taking lost-wax carving classes, she was hooked and @communionbyjoy was born. 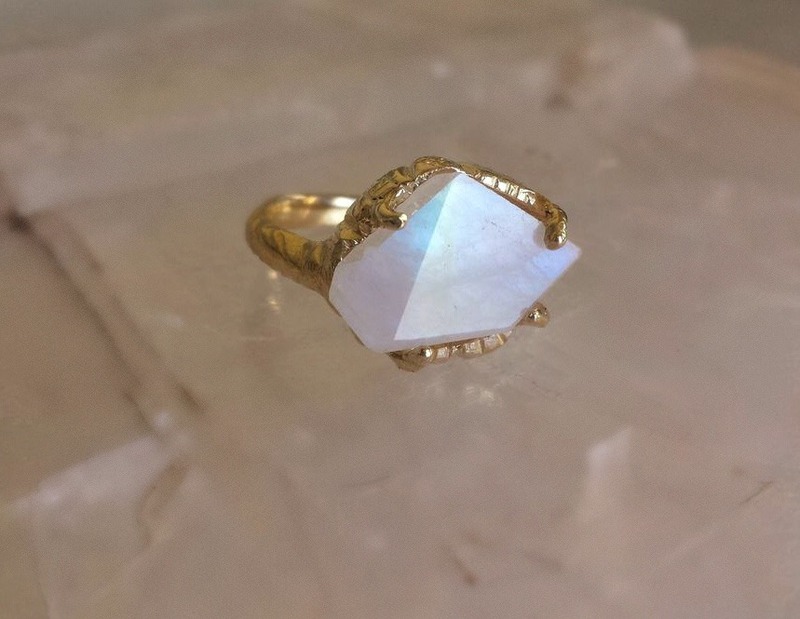 Now she’s been sculpting jewelry for over 10 years, calling Culver City, CA home. She works in wax, carving miniature sculptures into rings, necklaces and earrings with dental tools, files and sandpaper. Her intricate pieces draw from nature and the mystery behind the veil of life. 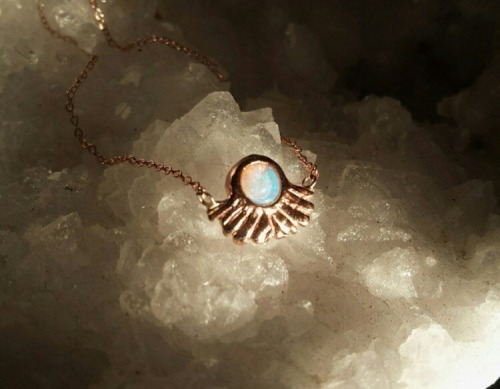 She loves ritual and symbolism, a clear inspiration in her jewelry. In her own words, her brand empowers strength with feminine elegance. It is modern vintage with a touch of bohemian flair. 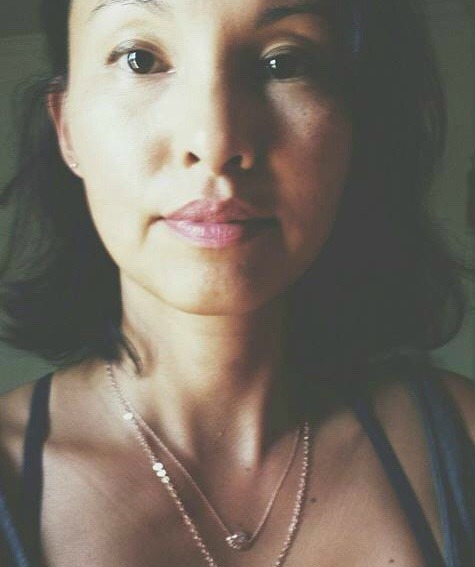 She loves making jewelry that carries an energy of inner-strength and contains the power from the designs or stones she sets into them. A week ago I finally got to meet the creative force behind one of my favorite jewelry lines of all times,COMMUNION by Joy. 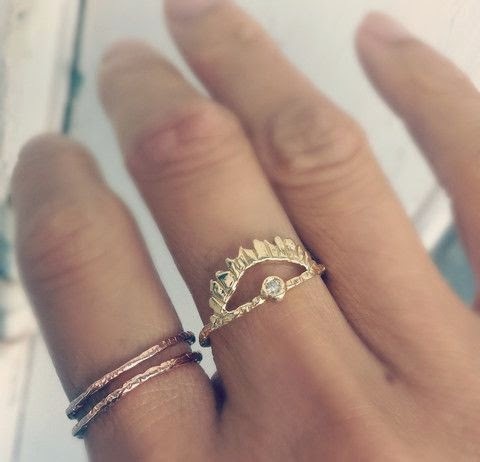 I have been following her work for the past couple of years on Instagram and every single time she posts a new piece, my fingers buzz in anticipation of the day they get to be adorned by her work. 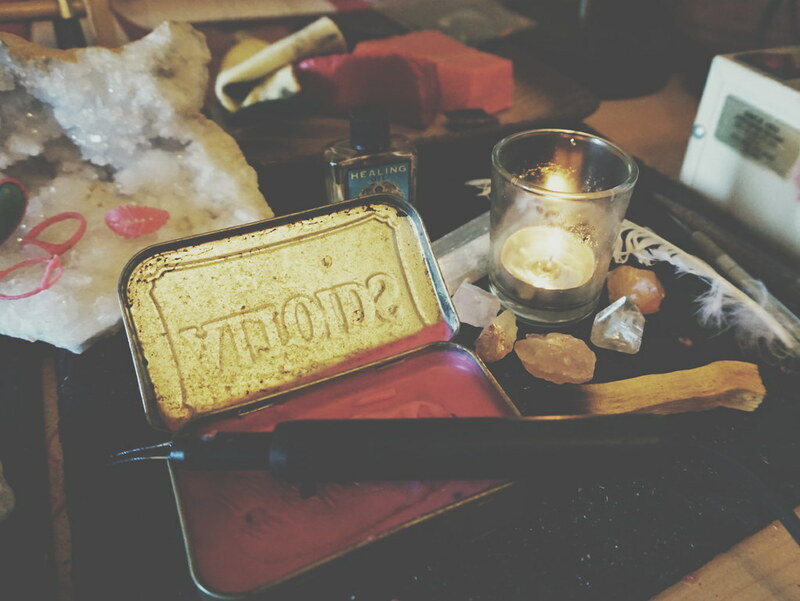 She's an incredible artist who pulls stories from wax to create powerful talismans. Her rings feel like tiny sanctuaries, quiet places to return throughout the day to be reminded of the strength, beauty, magic, and enchantment of being a woman. 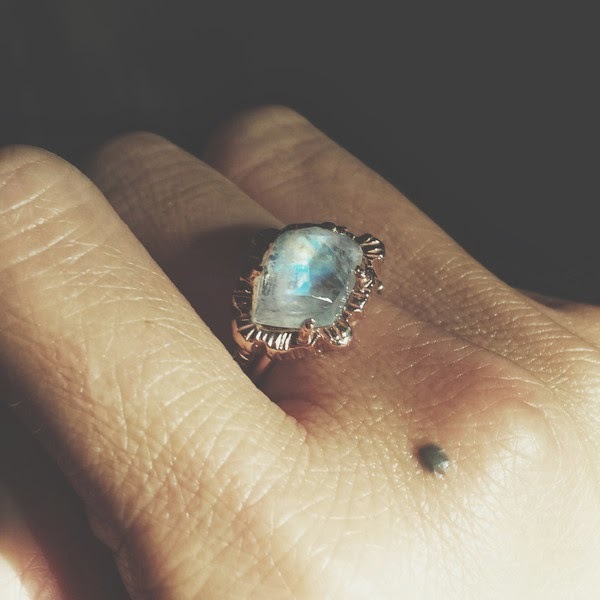 She so graciously let me tag along on her work day to see the process of her jewelry as it changes from wax to shining ring, all the while talking rituals, intentions, and nature. 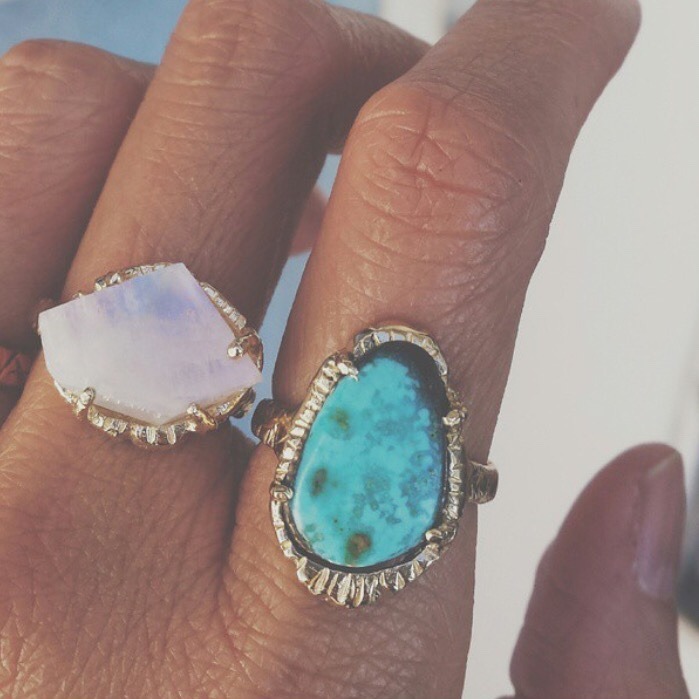 She pours so much love and intention into every piece of jewelry, that they practically vibrate at the touch. So go ahead, I dare you not to drool all over her work. LADY LU: How long have you been making your beautiful talismans? JOY: I have been making my art for over 10 years. I have always loved art since I was a child. I studied some art history in college and dabbled in painting and drawing. 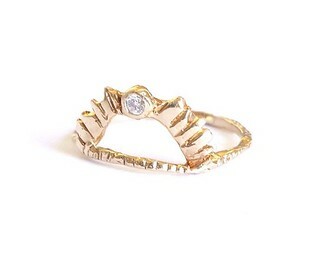 My calling for jewelry design came when I worked at an art gallery and realized that I wanted to be the artist. After working in a gallery with artists, I decided it was time to tap into my own artistic side. 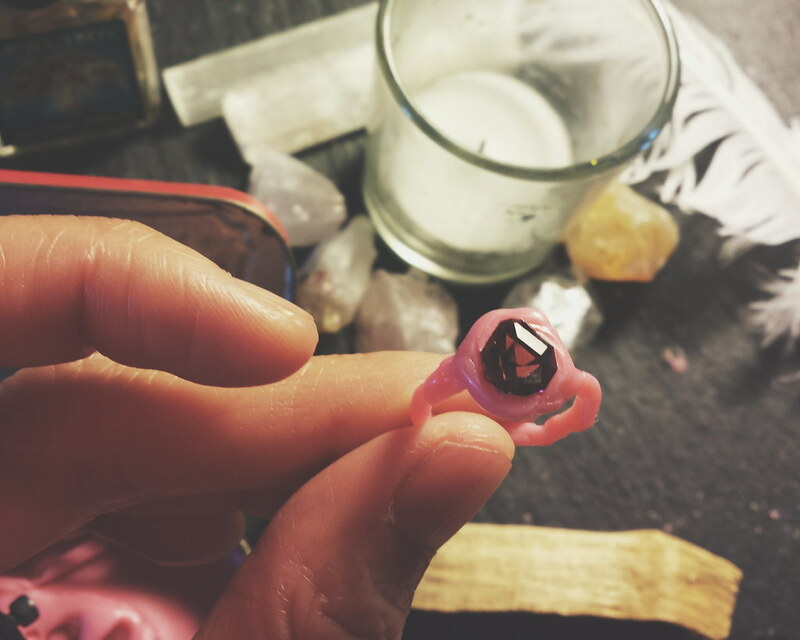 I started taking lost-wax carving classes at night and I was hooked! I loved the idea of being able to sculpt anything I wanted. I feel my brand empowers strength with feminine elegance. It is modern vintage with a touch of bohemian flair. LADY LU: How did you arrive at the name Communion by Joy? JOY: I loved the definition of COMMUNION it was so fitting for me and what I want to express. LADY LU: Where do you find inspiration for your work? JOY: My inspiration comes from nature and the mystery beyond the veil of life. This is a feeling I try to capture with my designs. When I give my attention to the life around me inspiration follows. I love ritual and symbolism. I find my inspiration communing with the spirit in nature, animals and people. I love to make jewelry that carries an energy of inner-strength and contains the power from the design or the stones I set into them. My process for keeping the creative fire going is by connecting to people and their stories. LADY LU: Do you have a favorite stone with which you like creating? LADY LU: What is the magical and rewarding part of your work? JOY: I love to share the magic of beauty through art. I put my soul and heart into all the pieces I create and I love when people tell me that they can feel that presence in my jewelry. Communion - noun. The act of sharing one's thoughts an emotions with another or others; Intimate converse. I met Joy this past fall and we hit it off. She is a ray of positive energy! I knew who she was because I was a fan of her designs. Now, I own a Communion piece of my very own that is a part of my daily ring stack. And Joy was kind enough to let me interview her. Since Joy was a child, she always loved art. She studied art history in college and dabbled in painting and drawing. 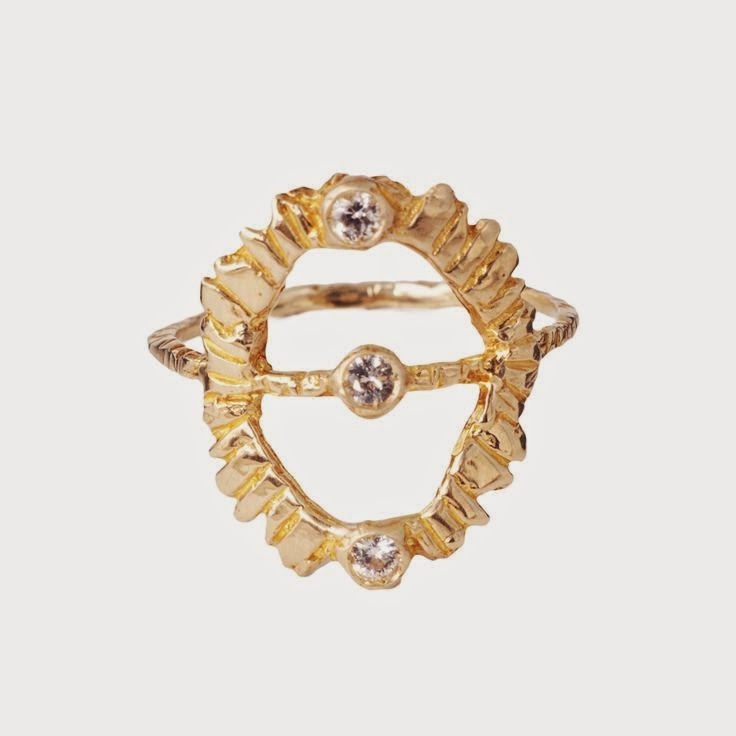 Her calling for jewelry design came when she worked at an art gallery and decided her passion was to become an artist. 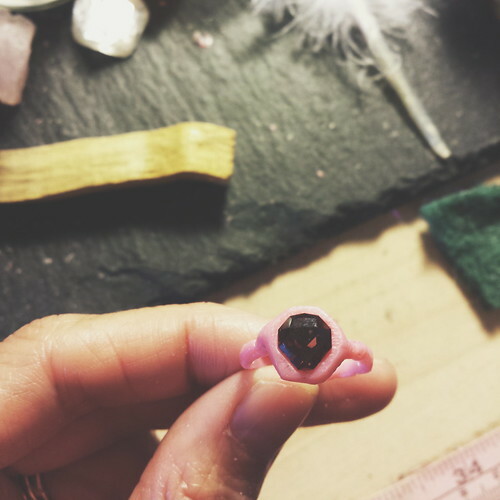 As she was exploring her artistic side she started lost-wax carving classes and became hooked. She loved the idea of being able to sculpt anything she wanted. Her brand. Communion, empowers strength with feminine elegance. It's modern vintage with a bit of bohemian flair. Joy radiates this from her style in clothing to her personality. She is her brand. 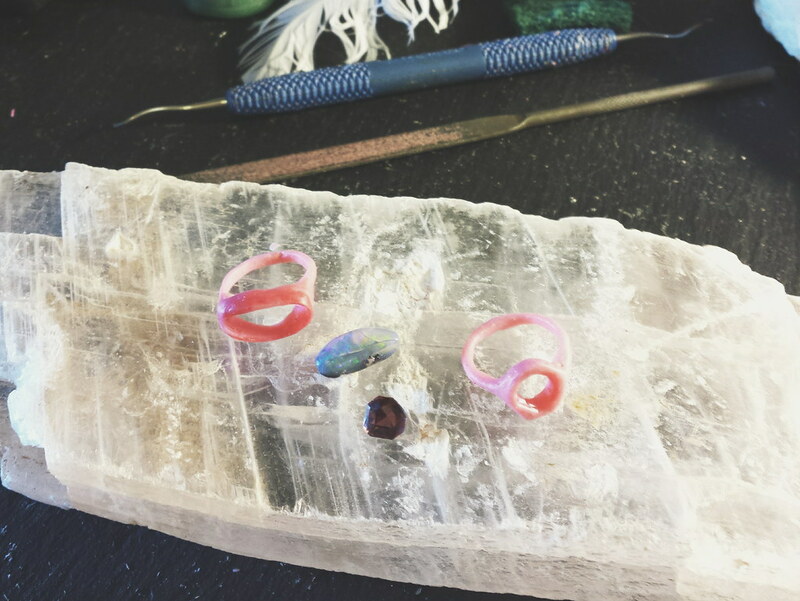 The process: "Making jewelry for me is not only an artistic practice, it's also a spiritual one." She sorts our her thoughts and feelings in her work - they become a part of her designs. Before getting started on a piece she allows herself to meditate, allowing herself to be used as a creative vessel. The ideas come to her as she carves and she makes several abstract pieces. When they are done she meditates again and gives the design a name. The Inspiration: "I look for inspiration in nature and the mystery beyond the veil of life. This is a feeling I am trying to capture with my designs." When Joy gives her attention to the life around her, inspiration follows. She loves ritual and symbolism. She finds inspiration communing with the spirit in nature, animals and people. She loves to make jewelry that carries an energy of inner-strength and contains the power from the design or stones she sets into them. Her process for keeping the creative fire going is by connecting to people and their stories. 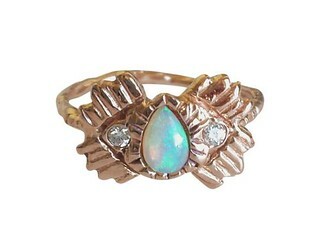 Joy's favorite design currently is her 'Enlightened Shaman' ring. It's inspired by a Navajo Prayer. It reminds her to see past the veil of life and walk in beauty as a warrior. Joy's favorite artists are Balthus, Joni Mitchell and Picasso. When she isn't designing she practices yoga and dines with friends and family. Her current favorite song is 'Case of You' by Joni Mitchell and her current favorite band is Fleetwood Mac. What's next for Communion? 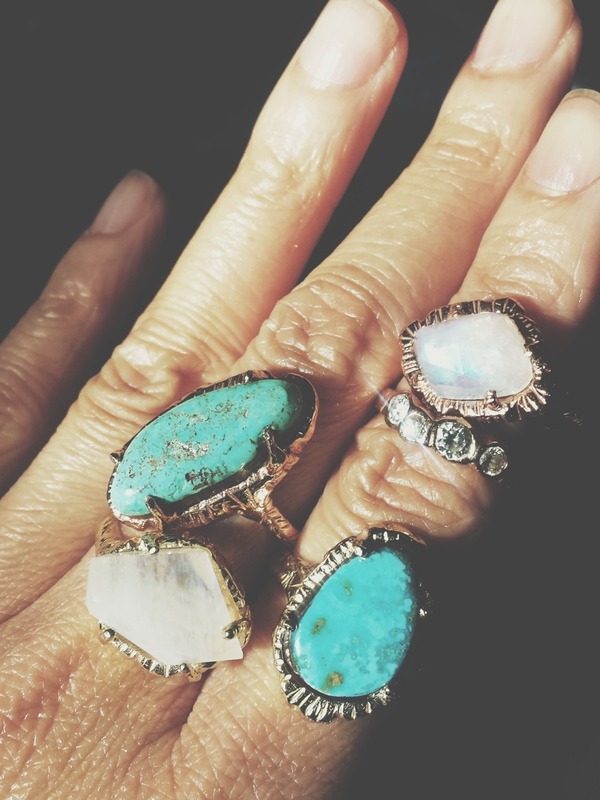 "Expanding my fine line collection to add one-of-a-kind rings and necklaces with my favorite stones, turquoise, opals, moonstones, pink sapphires and raw diamonds."